« Five Flood Gates Opened…who cares, catching fish! Weather has been down right hot! Yesterday, it hit the low 90s. Today, and Wednesday, they are forecasting upper 80s and if the sun comes out, I would not be surprised to see it in the 90s again today. Thursday are Friday are supposed to be in the mid to upper 70s. There are chances of thundershowers Wednesday night into Thursday morning. A cool front coming through over the weekend so temperatures will drop into the mid 60s Saturday and Sunday with a chance of showers. Monday back into the lower 70s. We continue to see five flood gates and four generators on Taneycomo. At noon today, Table Rock Lake pool level was 929.05. 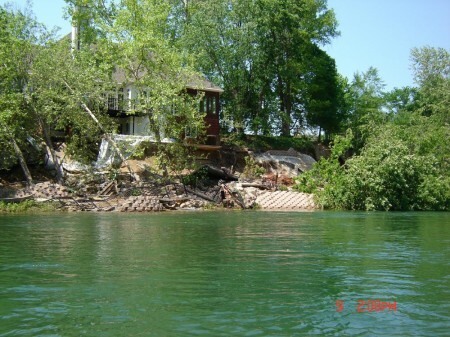 Beaver was as 1129.2 and Bull Shoals is now at 692.97. Took myself fishing yesterday. Wonderful day. Wanted to get a feel of the current with the drift boat and check for more layups. Fished, and caught fish, on everything from the big ugly with a primrose & pearl size 18 midge dropped 3 feet, the steroid ruby midge with a size 16 red tunghead midge dropped a foot and fishing 6 to 7 feet deep, to stripping the holographic green crackleback and our new addition, the silver bullet (just another version of the holographic green but tied with holographic silver). Fish seem to like either version of the cracklebacks equally well. On my way down the river, I did take a few more shots of some of the damage. 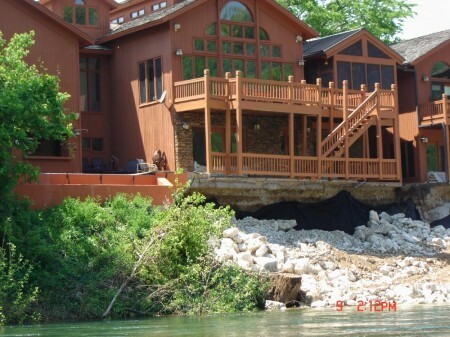 Definitely much more damage than the flood of 2008. This house at Pointe Royale lost their entire back yard where they had recently built up, added a pool as well as a retaining wall to hopefully keep down the erosion. Another home at the Pointe. In the process of getting fill in to prevent any more damage. 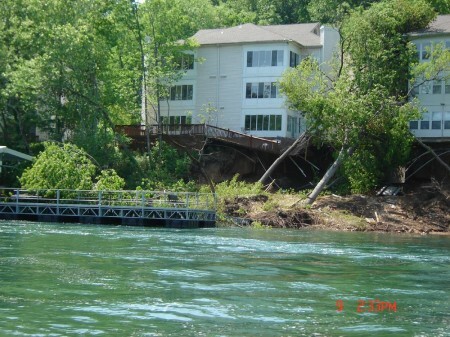 Several of the condos just behind Fall Creek Dock have lost their decks as well as yard areas around the condos. If anyone is wondering, Fall Creek Dock is still in tact. If they had any damage, it was not visible to me. 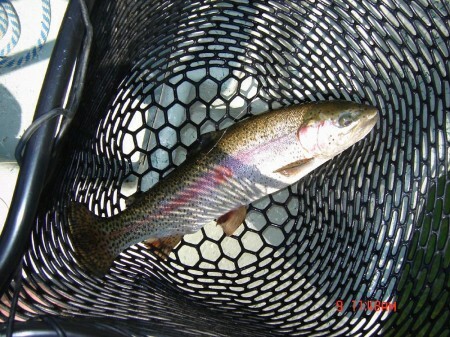 This entry was posted on Tuesday, May 10th, 2011 at 1:50 pm	and is filed under Fishing Reports. You can follow any responses to this entry through the RSS 2.0 feed. You can leave a response, or trackback from your own site.